Here’s a guide on how to use Calendar Shortcuts feature to link Uber to Calendar app on your iPhone. Do you have a packed calendar including a lot of social or work-based events that are constantly popping up on your device? Rather than drive yourself, do you more often than not opt for an Uber to handle your transportation needs to the events? Well, if you do, and you want to make that whole process a lot more streamlined and efficient, then you’ll be pleased to know that Uber has announced a new Calendar Shortcuts feature designed to help you get to your commitments on time. Step 1: First and foremost, you’re going to need to be inside of the Uber app. If you don’t have it on your phone, then it goes without saying that you’re going to need to install it from the App Store and sign in with your Uber account. If it is already on the device, then simply launch the app as you usually would. Step 2: Within Uber, head into Settings by tapping on the three horizontal lines in the top left corner. This will produce a new overlay menu, then tap Settings. Step 3: Here, select the Calendar Events option. Alternatively, you can also access this functionality directly from a Get started link on a Calendar Shortcuts card within the main app if one pops up. Step 4: From within the Calendar Events section, follow through the on-screen prompts and information to link the Uber app with your own device calendar. 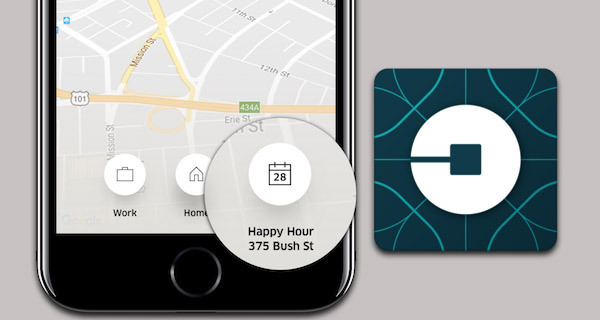 Step 5: With that process all set up, whenever you launch the Uber app, you will be provided with a new calendar icon at the bottom of the interface which shows the next item in the calendar. Tapping on that will load the event, which is essentially a shortcut to getting a ride to that location. It’s very simple to actually activate, but does require the understanding that any calendar event will need to have an address stored against it. As you can understand, Uber drivers won’t be able to get you to your destination without an address, right? The functionality is currently available on iOS, with support for Android to follow soon. So now UBER can harvest all your appointments as well ?